The closure of WildStorm comics, the DC imprint who spark had diminished somewhat in recent years, is simply one of several somewhat depressing but necessary reorganizations and shakeups to the structure of DC Comics over the past year as DC Entertainment continues building the new DC Comics. CMX, DC's manga imprint, Zuda, their webcomics imprint, and Wildstorm, co-publisher Jim Lee's company and studio, have all been shut down and had their titles and intellectual property either split up across the company's internal divisions or outright canceled. Okay. So what does all of this mean? What's the point of the closures? Our thoughts are after the jump, and you can share yours in a reader poll at the end of the article.With the deaths of CMX, Wildstorm, and Zuda, DC Comics has essentially stripped itself down to two halves: DC Comics, which handles superheroes and work-for-hire titles, and Vertigo, which handles creator-driven and owned works. There's a third half here, MAD Magazine, but it's generally off in its own lane as far as publishing goes, and tangential to the discussion for now. WHY CMX HAD TO GO: They Didn't Have Their Own "Naruto"
CMX was the first imprint to get the axe, in part because of how the manga publishing business works. You first have to license the books from a Japanese publisher, which costs a fair amount of money, and then push the books out into the marketplace. Without a tent pole title like "Naruto" that has enough success to keep your line afloat and gives you the cache needed to license bigger titles, manga publishing is difficult. What's more, a chunk of the profits from possible film, television, and other media adaptations of CMX's titles were probably going to go to the original publisher and artist, and then DC, rather than being split between DC Comics and the creative team alone. Since DC is part of Warner Brothers, who primarily traffic in film and television, it's easy to see why DC took the easy route and canned the line, especially since the real money in comics comes from movies these days. CMX can't function as an intellectual property farm, so it had to go. Zuda presented a slightly different dilemma. The problem with a webcomics initiative at a major publisher is the generally accepted business model of webcomics: Creators pump these comics out daily, weekly, or whenever they feel like it; we consume them for free, and then we support the creators via clicking on ads or ordering merchandise. The closest thing I ever saw to Zuda-related merchandise were these hats, which were not produced by Zuda, but rather by Mike Walton, creator of "Dual" for Zuda. There were a few printed volumes of comics published on Zuda, but only for strips that were considered hits. After Zuda's first closure earlier this year, all of the comics were moved over to DC's Comixology-powered digital comics. Comixology is giving away the first chapter of Zuda's comics and selling the rest, which suggests to me that there simply wasn't enough money in Zuda to justify maintaining the cost of maintaining it, no matter the quality of the books. Wildstorm getting the axe is perhaps the most obvious move, and at the same time, pretty unexpected. Titles like "Ex Machina," "The Winter Men," and Kurt Busiek's "Astro City" still enjoyed some level of acclaim, but they were owned by creators, not Wildstorm itself. As a comics universe, Wildstorm started to seem rudderless, with several line-wide upheavals just over the past five years, and sales have fallen accordingly. Regular creative team and cast changes have riddled the books, diluting the unique flavor of almost every book in the line. In a way, the fact that we've endured five years of collectively looking at Wildstorm's output with a jaundiced eye is the reason why Wildstorm's closure feels like such a surprise, despite being inevitable. There was a time period when Wildstorm could essentially do no wrong. They had Alan Moore and his America's Best Comics under the wing for several years. Scott Dunbier, Ben Abernathy, and John Layman shepherded several fantastic books to print. Ed Brubaker, Warren Ellis, Mark Millar, Bryan Hitch, Sean Phillips, Dustin Nguyen, Joe Casey, Duncan Rouleau, and quite a few more creators did some fantastic work for them. Wildstorm pioneered the Absolute format for reprinting comics. Heidi MacDonald's "The Wildstorm Legacy" is a particularly moving summary of Wildstorm's impact, and features eulogies from several creators involved with Wildstorm over the years. At some point, probably shortly before Grant Morrison's high profile relaunch of the entire universe went off the rails, Wildstorm's rep went from producing some forward-looking work to producing... just regular old comics. The creativity that once defined the line was replaced with something generic and, judging by sales, entirely unwanted. At that point, the only thing that set Wildstorm apart from DC Comics was having a different cast of characters, and that doesn't mean much at all these days. Publishing several video game and film tie-ins of varying quality gave Wildstorm a purpose and a focus, but it didn't give it enough of a reason to keep going. DC can print tie-ins and adaptations under its own banner, and the Wildstorm universe is already an accepted part of the greater DC Multiverse, so Wildstorm at its end was almost entirely redundant. That is cruel when stated so bluntly, but true. When you look at imprints at other companies, or even at DC itself, they always serve a specific purpose. MAX allows Marvel to publish cusswords and violence on a level that they cannot do in their more mainstream line. Icon allows Marvel to keep its favorite creators happy by giving them an outlet for creator-owned titles. Vertigo is largely composed of creator-owned comics for adults. What did Wildstorm do that DC couldn't do just as well? And so, the last imprints left standing are DC Comics and Vertigo. Recent weeks have seen control of DC Comics-owned characters being moved, officially or unofficially, from Vertigo to DC Comics. 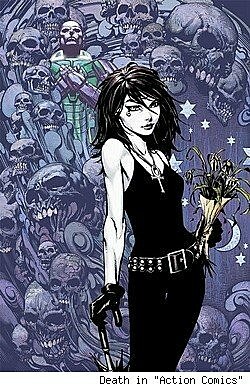 Swamp Thing and Death (and by extension, the "Sandman" family of characters) have both been publicly reclaimed by DC Comics. John Constantine is the one of the last hold-outs left at Vertigo, but the majority of Vertigo's hit series are creator-owned works like Brian Azzarello and Eduardo Risso's "100 Bullets," Bill Willingham's "Fables," and Brian K Vaughan and Pia Guerra's "Y the Last Man." This new, streamlined DC Comics has two focuses. DC Comics is responsible for maintaining the stable of DC Comics-owned superheroes and serving as an idea farm for Warner Brothers to exploit in other media. This means generating good stories, yes, but also characters and ideas that can be used in cartoons, movies, video games, and more. The fact that Geoff Johns has been working closely with the team behind the upcoming film "Green Lantern," the organized roll-out of the new Aqualad in "Brightest Day" and "Young Justice," and the hand of DC creative talent in games like "Batman: Arkham City" suggest that this is a formula that works, and will be employed for the foreseeable future. Vertigo serves as the place where creators get to work out and own their ideas while telling stories aimed squarely at adults. Vertigo is the bookstore-ready arm of DC Comics, with an army of titles that sell very well in trade paperback form and have a better chance of connecting with a wider audience than your average cape comic. Vertigo has had somewhat questionable success with translating its properties to film or TV, with the "Human Target" television show being the latest stab at making it work, but the book sales and Vertigo's reputation are where its value lies. Vertigo is generally viewed as the grown-up side of the DC Comics machine, with stories that aren't afraid to push boundaries and bump up against taboos. That rep makes DC a more well-rounded company, in terms of diversity of content, and lets them keep a toe-hold in the bookstore market. "Fables" is an evergreen title and a hit across various demographics. "Superman: Birthright" isn't, despite its high level of craftsmanship. In order to work as a part of DC Entertainment, a company that is focused on telling stories in a variety of formats and making some big fat Warner Brothers dollars, DC needed to shed some of the fat it gained over the past few decades. Anything that doesn't serve the greater purpose is counter-productive, no matter how well-loved it was amongst staff or the fan base. If it doesn't make dollars, it simply doesn't work in the new DC Entertainment. The dead imprints are going to be mourned, and with very good reason, but business trumps everything, no matter how mismanaged or critically acclaimed an imprint may have been. By stripping down to just DC Comics and Vertigo, and slightly adjusting the focus of both of those aspects of its business, DC has gained a focus that it didn't have even just a year ago. Even the impending layoffs, tragedy that they are, represent an attempt to create a more efficient DC Comics by cutting costs and, depending on the nature of the layoffs, revising the focus of the company. It will be interesting to see what changes the new DC Comics makes in terms of how it deals with the Direct Market and digital comics over the next year. DC Comics has gotten itself into shape internally, and the next step is dealing with external factors. This could include everything from strengthening the relationship with Diamond Comic Distributors, bookstores, and digital comics middlemen. Only time will tell, but I expect that the next wave of big news out of DC Entertainment will be about how it relates to other companies, rather than its internal workings.